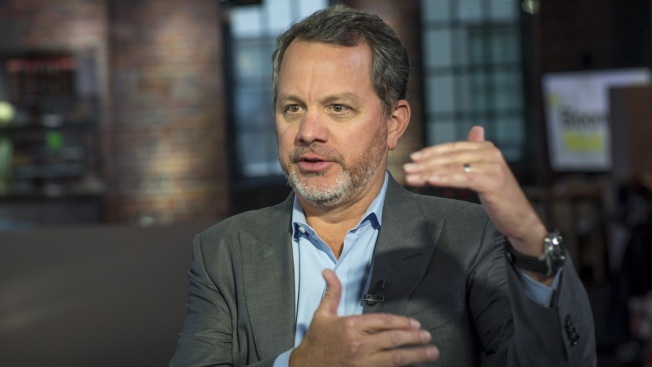 In this Aug. 16, 2016, file photo, William ‘Bill’ McGlashan, founder and managing partner of TPG Growth LLC, speaks during a television interview in San Francisco, California. Manuel Henriquez has resigned as CEO of Hercules Capital and TPG executive William McGlashan has been placed on indefinite leave at the private equity firm after they were accused in a scam to help their children get into top colleges. Other business executives charged included Agustin Huneeus, head of Huneeus vineyard in Napa Valley, California; Gordon Caplan, co-chairman of international law firm Willkie Farr; Douglas Hodge, a former CEO of Pimco; and Robert Zangrillo, CEO of Dragon Global, an investment company whose website says it’s managed more than $1 billion in companies that have over $500 billion in market value today. The enterprises did not immediately respond to CNBC requests for comment. McGlashan was charged with working with a college prep company to create a fraudulent athletic profile for this son in order to be recruited as an athlete at USC. He also allegedly funneled $50,000 in bribes into the nonprofit arm of the company to have a cooperating witness correct his son’s wrong answers on the SAT exam, prosecutors said. Justice Department officials said at a news conference on Tuesday it was the biggest college admissions scandal it has ever prosecuted. Here are the prominent business people implicated in the college admission scheme from CNBC.